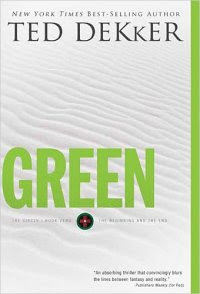 Green, the book that readers of The Circle Trilogy have anxiously awaited, the book that finally brings the 3 different series all together, the end and the beginning. The storyline picks up where The Circle Trilogy, The Paradise Novels, and The Lost Books leave off. Although Dekker claims you can read it first or last, my personal recommendation is reading it last! This story is filled with betrayal and hope, the Apocalypse and great redemption, ultimate expressions of evil and good, hate and love…of course love, because that’s what all the books are ultimately about. The passages about Elyon literally gave me goosebumps! In typical Dekker fashion it is a fast paced, action filled adventure that throws you between two realities. Also in typical Dekker fashion I wasn’t sure what I thought of it till the very end. My verdict? The only thing I didn’t love was that, as he promised, all of the books form a perfect circle. Where Green ends, Black begins…even though Black is the first book and Green is the last. I’ve never read or heard of a series of novels like this and the lack of resolution is frustrating and yet brilliant at the same time. Because, really, would I have expected anything less of Dekker? Sounds like an interesting series…or 3 series. It sounds like they’re Christian books? I think I’m going to have to read these now…that is, IF I can ever get the other books read I got months ago. Id love to read this too…. I havent read a book in God knows how long! I review for TN too, and wanted to pick this book so bad, but hadn’t read the other two…so I passed it by. I must go pick up all three because I am completely intrigued now!! my review hasn’t been posted yet at amazon, has yours? So I finally started the O’Malley series (only 4 months late lol). Previous Previous post: And yet another….